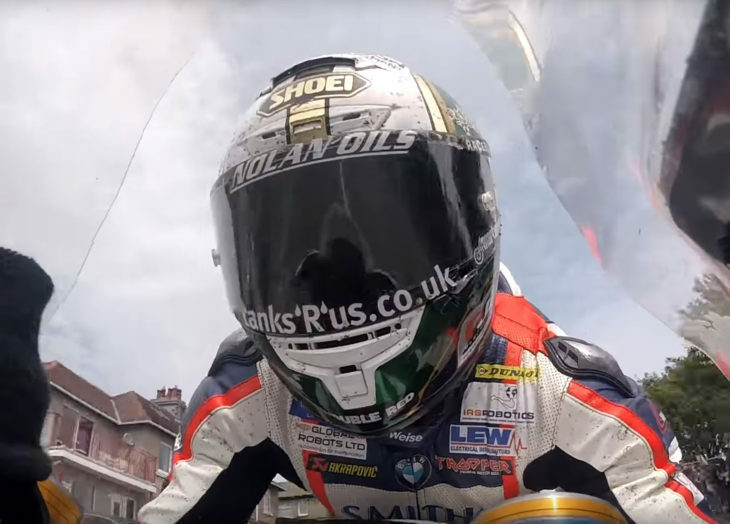 Many Isle of Man TT records were broken this year, but one man is the fastest ever at the event … Peter Hickman, who won the Senior TT. Two videos below take you onboard with Hickman during his historic run at the Isle. The first gives you Hickman’s view out in front of his motorcycle, and provides a sense of the incredible speeds and danger faced by Isle of Man TT participants. The corners (and the curves and the walls) come up so quickly it is mind blowing. I know these guys have a handle on how well they are doing on any particular day but do they KNOW when they are setting a record pace? Oh wow…the fuel guy. SHEESH. Fuel rigs are the same for all bikes at TT (see cans on poles along pit wall) physics dictate how fast fuel will flow into tank. If you watch closely refueling only takes slightly longer than tire changes ( you can see the bike being let off paddock stands). Having enough fuel to make it around the island takes precedent over a couple of seconds in the pits! Electronic suspension should make the race safer as time goes by. They can wear air cushioned suits if they can afford it. But the main thing is to just get so many laps in that you know the road like the back of your hand, just in case. Even after injury these guys come back again, though McGuinness could not quite make it back on the Norton. A rider who feels safer only goes faster. If they ever become truly concerned for overall safety without changing the nature of the course, the only answer is to lower speeds (cap @ 600cc, production engines only, whatever..). I really do like the electronic suspension idea, though. Seems like there could be lots of opportunity there to address the way suspension becomes less effective at greater lean angles. The thing is, Michael Dunlop lapped at a shade under 130mph (average) on a 600cc bike this year. And when you think of how much those bikes lose out to the superbikes on the 160+mph sections, that tells you that it’s probably even more dangerous than the larger machines (straights being safer than corners). The place terrifies me and delights me in equal measure. It’s a true dichotomy. As records are shattered at IoM wobbles seem to be on the increase. Some of those youtube airborne wobble landing vids are super scary. Finite element model the whole rider/chassis/tire/road system, simulate the wobble, then strategically stiffen/dampen/etc… (LOL I’m retired but can’t stop analyzing). Good luck on modeling that! We can’t even model basic motorcycle handling on smooth roads. It is a monumental challenge. Motorcycle design is still as much art as its science. Experience gained through trial and error is how its done. I always thought I could try that race, knowing I would never win. But those videos… Awesome! I would crash and burn long before I ever got close to that pace! No one starts their racing at the Senior TT for just that reason. Those riders are incredibly experienced at lower classes and at lower speeds. Not that its not dangerous with an 125 at an amateur race.